A message came in from a bride of mine who is expecting her first baby, so we’re planning a maternity session. Seniors of mine are becoming brides of mine. One person has been in four of the weddings I’ve done recently, either as a bridesmaid or the bride. Sisters. Entire families. Cousins. Adoption celebrations. Memorial images. Before I break into Elton John’s “The Circle of Life” or “Can you Feel the Love Tonight” – hmmm, why the Lion King theme? I shot Mary-Anne’s wedding. I took her bother’s senior pictures. I took a few 1 year anniversary shots for Mary-Anne and her husband, Connor. 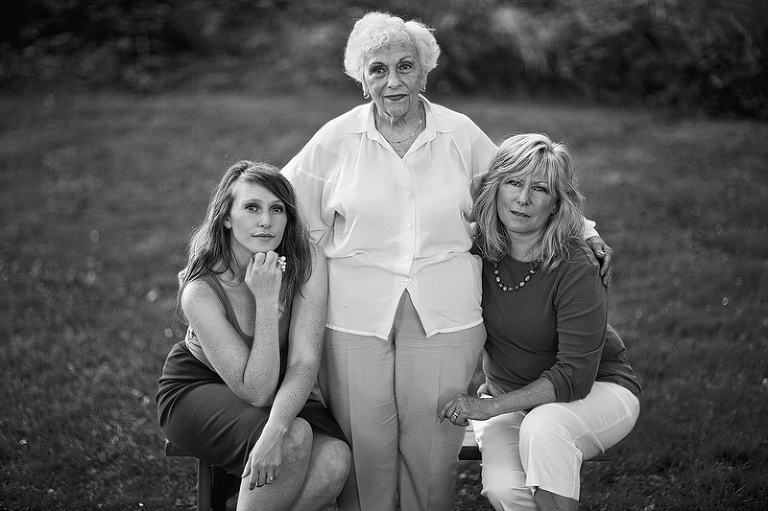 We finished this 3-generation shoot, recently. I am a quiet, private person, however; personal investment in the lives and loves of my clients is just about the best part of this job. Not only does it show the clients’ satisfaction and willingness to hire me again (surface but important), it shows a developing trust that can extend for years (deep). I feel like these ladies speak volumes about the strength, love, and personalities they possess… so I’ll let them do just that. Some film, some digital. All family. Eric Krebs - These are awesome, a classy collection that captures each of them and all of them at the same time. Well done Jay… Cheers! Maddie E. - These are absolutely beautiful. These women will cherish these forever!! Wonderful job! Jared Tseng - So in love with this shoot. What a special session to be a part of. Heather Elizabeth - These are so stunning, Jay. I love your mixture of film and digital. That hands photograph still gives me chills.